Use our Salary Guide to adapt as fast as the talent you’re after. Your company will only go as far as your creative and marketing minds take it. They build your unique brand and convince consumers to buy your products and services. But to acquire the best of them, you have to do some convincing of your own—and it starts with salaries. Even with the justified chatter about career paths, culture and work-life balance, salary is still the one. In fact, two thirds of respondents to the recent Workforce 2020 study conducted by Oxford Economics and SAP SE, agree—they all said money matters most. 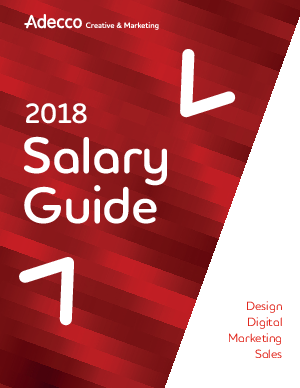 Our Creative & Marketing Salary Guide is the single most important hiring and retention tool for your company. It’ll help you confidently discuss and offer convincing salaries that help you land new talent and keep old talent.